MOUNT HERMON, CA (ANS – March 31, 2017) – If you’re a committed atheist and your spouse becomes a follower of Jesus, it might just rock your world. That’s what happened to hardnosed Chicago Tribune legal affairs editor Lee Strobel, who marshalled his skills in journalism and law to find out what had happened to his wife. “Instead,” he continues, “I was pleasantly surprised – even fascinated – by the fundamental changes in her character, her integrity, and her personal confidence.” He aimed to investigate faith from top to bottom to see if it made sense. Educated at the University of Missouri School of Journalism and Yale Law School, Strobel determined to use the rigorous methods a veteran journalist and legal analyst would about a court case: sifting evidence, evaluating reliability, considering alternatives. He studied history, archaeology, and ancient literature and interviewed experts. Strobel wanted to avoid pitfalls he had experienced earlier in his career when an apparently clear-cut court case he was covering had its guilty verdict reversed. In retrospect, he realized he had been viewing the facts through preconceived biases that blinded him from objective evaluation. He determined to study from a fresh perspective the faith he had thought was a fairy tale. For nearly two years he asked hard questions about source reliability, about Jesus’ life, death and alleged Resurrection, and more. The book and the film present what he discovered, not as academic treatises – though the book is well written for thinking readers, and extensively documented – but in the context of colorful, touching stories about how he wrestled with his findings. Regarding Jesus, he found multiple attestations that Jesus claimed deity. Jesus’ “I and the Father are one” New Testament claim is echoed by contemporary friends…and even enemies, who accused him of blasphemy for an assertion they considered outrageous. Jesus fulfilled many Hebrew prophecies regarding the Jewish Messiah. Strobel cites Peter Stoner, a mathematician who calculated the probability of just eight of these coming true in one person as one chance in 1017. And Strobel found convincing evidence that Jesus was executed, buried, and returned to life. The tomb was empty and many eyewitnesses said they saw him alive again, some at the cost of their lives. He concluded, “The atheism I had embraced for so long buckled under the weight of historical truth. 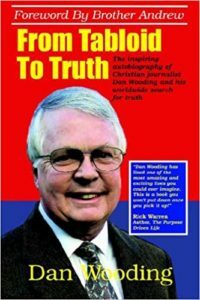 …It would require much more faith for me to maintain my atheism than to trust in Jesus of Nazareth!” He invited Jesus to forgive him and become his personal friend in 1981. The Case for Christ is a compelling film that is sensitive toward those who disagree and aims to get viewers thinking about matters that can make a world of difference in their lives and families. Well worth seeing. 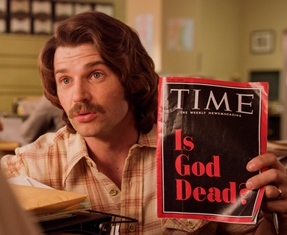 Photo captions: 1) Atheist Lee Strobel (Mike Vogel) discusses faith with a Chicago Tribune colleague. 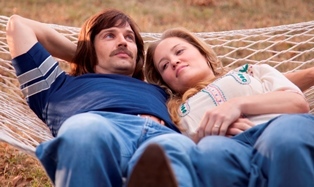 2) Lee (Mike Vogel) and Leslie (Erika Christensen). 3) Faye Dunaway plays a psychology professor. 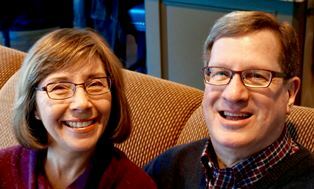 4) Leslie and Lee Strobel. (Photo: Heidi Mittelberg). 5) ANS Founder interviews Lee and Leslie Strobel at the recent NRB Convention in Orlando. (Photo: Peter Wooding). 6) Rusty Wright. Editors: For access to higher resolution versions of these images and more, check here, here and here. **You may reproduce this or any of our ANS stories with attribution to the ASSIST News Service (www.assistnews.net). Please tell your friends that they can receive a complimentary for our news service by going to the above link and signing up there.